There has got to be more to classroom discipline than this, especially in Sunday School or other Bible classes! Are teachers getting beyond crowd control and mere punitive reactions to misbehavior? 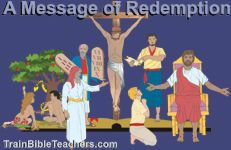 Are they using these situations as opportunities to help students become more Christ-like? Teachers need help with an overall perspective on discipline as well as how to deal with specific issues. Learn why. Also Read: Discipline Issues Making Your Teachers Want to Quit? How to love the kids you wish wouldn't show up. If you try to transplant flowers with hardly any roots, the flowers often don't make it. Occasionally this kind of transplant will thrive without much trouble but usually you have some work ahead of you -- extra watering and fertilizing. So in disciplining, if you do not have healthy roots, managing the classroom will be an uphill battle. Many teachers will get so frustrated and discouraged that they quit. In this handbook you will find forty pages of training with 30 classroom discipline tips for effectively managing the classroom. In this 97 page teacher training workbook, Bible teachers will learn to get beyond mere tactics or crowd control to a more comprehensive style of classroom management using a biblical grid. Teachers can make a difference in the lives of students even in the process of disciplining. If Bible teachers are not exercising Biblical Authority then students might be receiving conflicting messages between what is communicated in the lesson and what a teacher does. This 3 page worksheet includes a comparison chart showing the different ways to manage the classroom in light of what they teach and the effects they have.